Soup is not a type of dish most people would be likely to associate with chicken wings. It may even be the case that the very suggestion would be more likely to get eyebrows raised than mouths watering. The fact is, however, that chicken wings are perfect for making soup in a number of ways. The bones are used to make the initial stock, the meat on chicken wings does not tend to become stringy like chicken breast meat when incorporated in soup and the wonderful flavors of the wings is of course imparted to the soup's other ingredients. This recipe was prepared over the course of two days for convenience, the stock being made the first night and the soup proper the second night. If you wish, you could of course prepare it from beginning to end over a period of several hours on the same day. Lay the chicken wings in the base of a large soup or stock pot. Scatter with the sea salt and peppercorns. Wash the carrot, cut off and discard the top and roughly chop. Slice the peeled half onion. Discard the seeds from the bell pepper halves (note that the other halves of each will be used in the soup proper) and roughly chop or slice. Add all the vegetables to the pot with the chicken wings. Pour the four pints of water in to the pot and put it on to a high heat until the water begins to simmer. Reduce the heat to maintain a gentle simmer for ten minutes only before turning off the heat, covering the pot and leaving the wings to complete cooking in the residual heat for a further thirty minutes. After half an hour, it is important to remove the wings from the still very hot stock or they will overcook and the meat will become tough. Use a large slotted spoon to remove the wings only to a large bowl or deep plate. The stock pot should then be re-covered, as you are not finished making the stock yet. The wings should also be covered until they are cool enough to be comfortably handled. You should then peel off the skin and pluck the meat from the bones in small pieces. Discard the skin only. If you are intending making the soup proper the next day, add the meat to a small plastic dish and refrigerate overnight. Otherwise, simply add to a bowl, cover and set aside for the time being. You could if you wish use the chicken broth which has already been formed at this stage for your soup but I wanted a particularly robust stock for this recipe. What I did therefore was return the stripped bones to the pot and bring the combination back to a simmer. I then simmered as gently as possible, with the lid in place to minimize liquid loss in the form of steam, for a further two hours before turning off the heat and leaving everything to partly cool for an hour. This makes straining safer. Use a slotted spoon to remove the larger pieces of solids from the stock. These should be discarded in your food recycling bin, where available. Suspend a fine sieve over a large bowl and line it with two or three sheets of kitchen paper. The kitchen paper absorbs a lot of the fat, making your finished soup a bit healthier, as well as catching any smaller pieces of bone or vegetable which may have broken off during cooking. Slowly and carefully, start pouring the stock through your makeshift strainer. This will have to be done in stages and you may have to change the kitchen paper if it becomes clogged with fat molecules. When the stock was fully strained, I added the lid to the bowl and refrigerated it overnight but if you wish, you could carry on to the next stage immediately. Pour the strained chicken stock in to your clean soup/stock pot. Finely slice the bell pepper halves and add them to the stock, along with the fajitas spice. Stir well, put the pot on to a high heat until the liquid begins to simmer. Turn down the heat, cover and simmer gently for fifteen minutes. Add the chicken pieces and cilantro to the soup, stir well and simmer for five more minutes only. The idea at this stage is simply to heat the chicken through and allow the flavor of the herb to infuse the soup. All that remains thereafter is to taste the soup, adjust the seasoning with salt and pepper if required and serve. Hopefully, the recipe on this page will have gone some way to convincing you how truly versatile chicken wings are and how they are not simply all about being deep fried or oven roasted before being eaten straight off the bone fast food style. There really is no limit to the different ways these tasty morsels can be prepared, cooked, served and enjoyed. 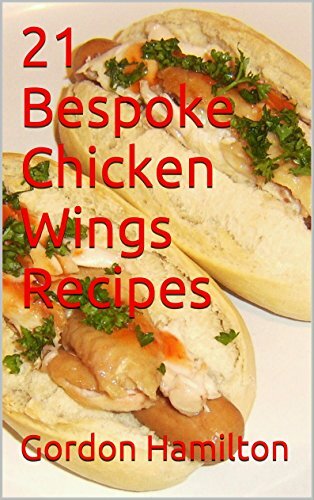 If you are looking for further information in this respect or still need convincing, the fabulous bargain e-book featured below could be just what you are looking for to help you take your chicken wing recipes to whole new levels. Recipes include Chicken Wings Dogs with Habanero Sauce, Scottish Haggis Spiced Roast Wings, Chinese Lemon Chicken Wings with Fries and 18 more! I have never tried to make chicken soup with wings before. That's a great idea. I also like how you took the meat off the bones when done and then kept cooking the bones to flavor the broth. I think that would work better for other chicken parts as well. It's raining here today, so I had chicken soup on my mind, lol. Thank you, LavenderRose. I'm glad you like the idea and you are of course correct, this would work with any part of a chicken re the stock making process.